Hello there, today I have the Christmas card that I made for my brother, SIL, niece and nephews to share with you. 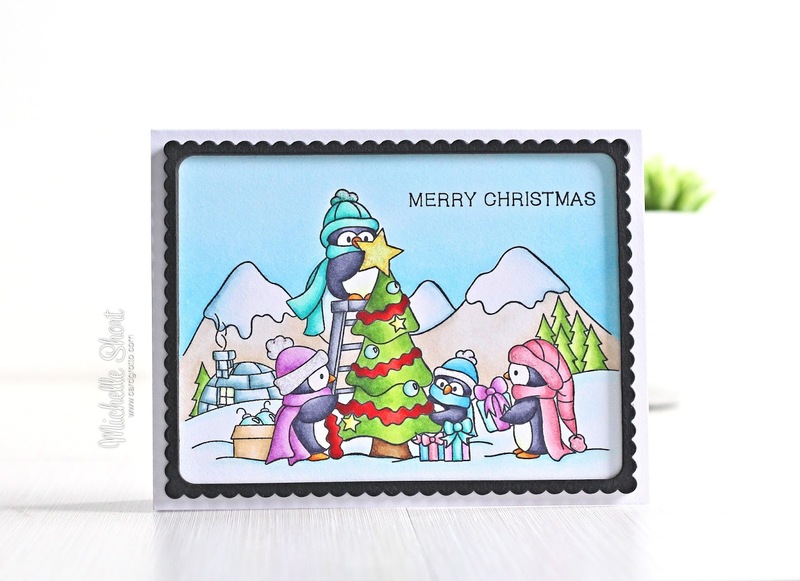 I absolutely love this image from Simon Says Stamp, such a cute one and great for colouring. I started off by stamping the penguin image on to a piece of white cardstock using Memento Tuxedo Black ink. I then added the sentiment, from the same set, at the top. The whole image panel was coloured using Copic Markers (colours used listed below the supplies section). The panel was added to a white A2 card base with ATG. I then cut four SSS frame dies from black cardstock and layered these up. The piece was then added to the card base on top of the image panel to frame it. To finish, off I added Star Dust Stickles to the penguin's hats and the star. I also added Glossy Accents to the baubles. COPIC MARKERS: Penguins - BV29, BV25, BV23, YR18, YR15, Y11, Y000. Hats, scarves & presents - B05, B02, B00. BG49, BG13, BG11. R85, R83, R81. V06, V05, V04, V01. Tree - YG17, YG23, YG03, YG01, E59, E57, E55. Star - Y15, Y13, Y11. Baubles - BG23, BG10. Box - E55, E53, E50. Snow - BG10, BG02, BG000. Mountains - E42, E41, E40, BG72, BG70. Igloo - BG75, BG72, BG70. Sky - B01, B00, B000, B0000. I must apologise for the photos again. I am not sure if it is the Stickles and Glossy Accents reflecting off of the lens or just the dark lighting. Either way, I hope you can still see what the card is supposed to look like! Thank you so much for visiting me today. I hope you are having a great week so far. I must get on and wrap some presents up! Have a great day! This is just too darn cute...love your adorable holiday scene. Lovely card to send to a family. Have a very merry Christmas, Michelle! What a lovely family card!! It looks like all the family joining in to decorate the tree and I love the colours you chose!